Celebrate the season with two essentials: wine and chocolate! 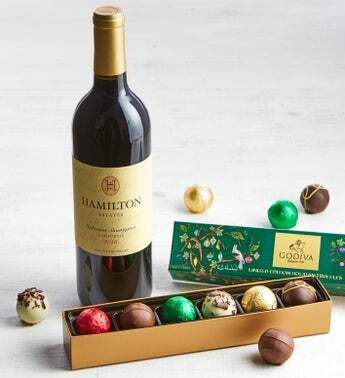 This unbeatable duo features a delightful California Cabernet from Hamilton and Godiva's Limited Edition Holiday Truffle Flight box which holds six decadent truffles with enticing holiday flavors including Cranberry Truffle, Tiramisu, Roasted Almond, Milk Chocolate, Salted Caramel and Christmas Cookie. Cheers! Hamilton 2017 Cabernet Sauvignon Wine This is the perfect Cabernet Sauvignon for everyday drinking. It’s so smooth you don’t even have to wait for dinner. It is a fruit-forward, smooth Cabernet which pairs equally well with light appetizers and hearty, savory dishes, rustic French breads or chocolates.